Happy Saturday, friends! 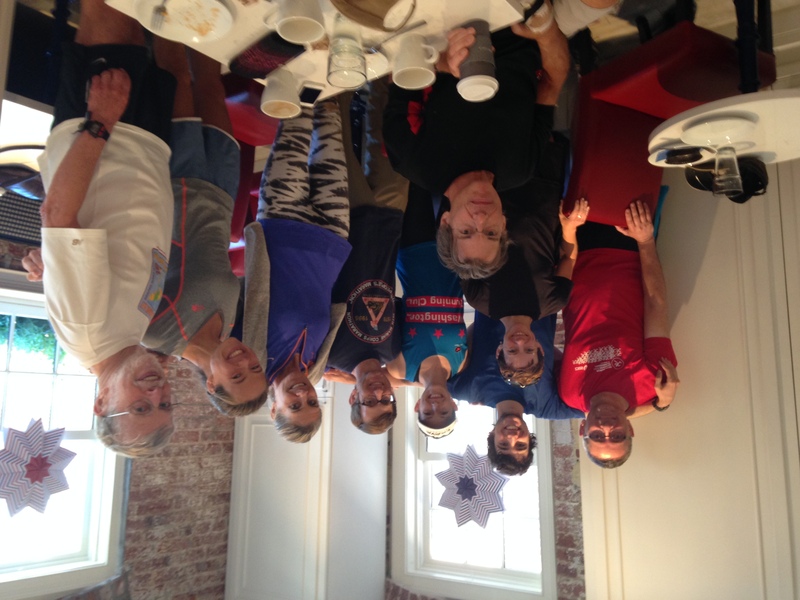 We’re looking forward to our Sunday Distance Run tomorrow, May 30, at 7:00 a.m. We’ll be meeting at our normal spot – in front of the CB2 store on M Street NW in Georgetown – and will have a variety of distances and paces. All are welcome! WRC Happy Hour – a great time had by all! 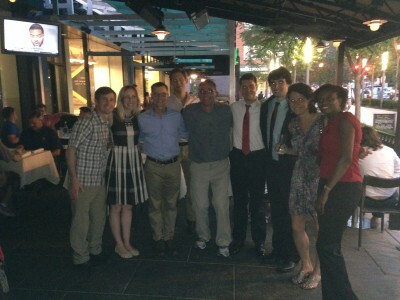 On Wednesday, May 27, WRC members gathered for a happy hour at Circa in Foggy Bottom. The weather was hot but the beers were cold – just what we needed to celebrate a great spring racing season. 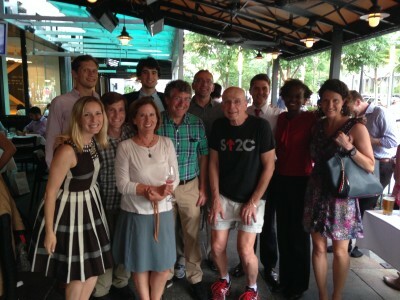 We were even joined by Walter, a fellow runner hailing from Florida, who is running the Marine Corps Marathon this fall! Stay tuned for our next happy hour! 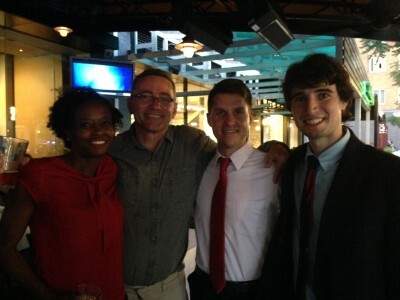 Julia, John, Pat, and Ben enjoy a fun evening out with a bunch of runners! John, Meghan, Charlie, and Julia know the importance of keeping hydrated! A final group photo to end a great evening! 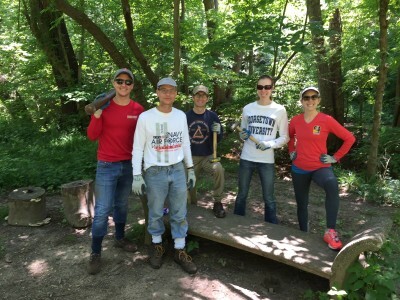 The Washington Running Club may be known for running, but many of our members want to give back to the community and make a difference. 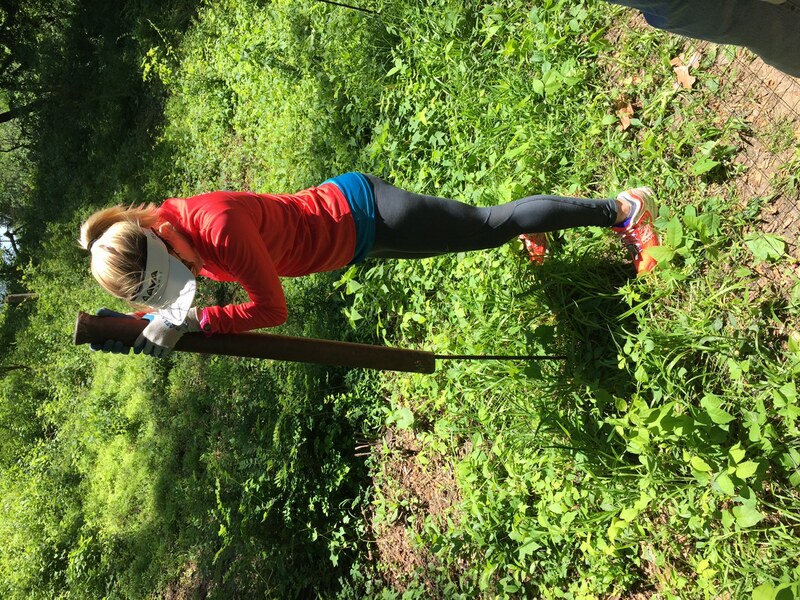 Memorial Day Weekend was the perfect mix of both running and giving back – and having fun while doing it! Dog Tag Bakery, located just off Wisconsin Ave NW in Georgetown, is a non-profit that sells baked goods with all proceeds going to work-study programs for disabled vets and caregivers. 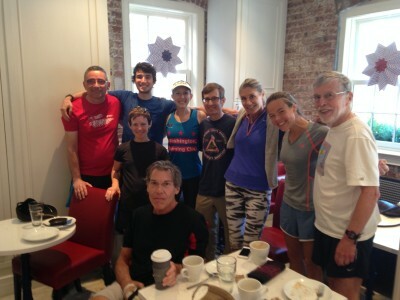 WRC met at Dog Take Bakery following our long runs to support this excellent cause. If you haven’t been, it’s a cute cafe with delicious baked goods and friendly service. 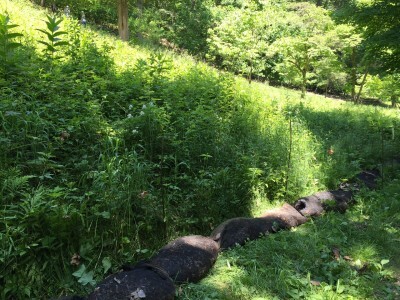 Mission complete: the fence around invasive species in Dumbarton Oaks Park. 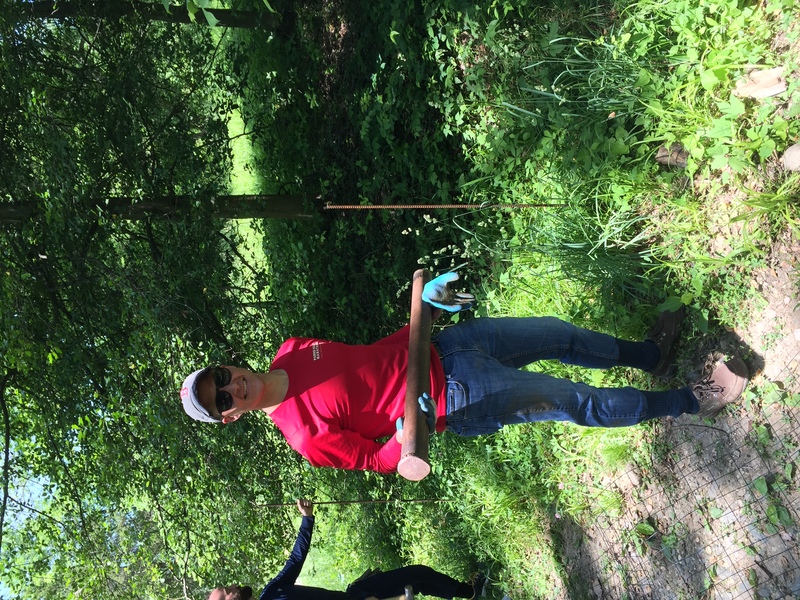 As if running wasn’t strenuous enough, several WRC-ers spent Sunday afternoon building a fence around invasive species that have taken over fields near the Dumbarton Oaks running trails. Led by the Dumbarton Oaks Conservancy, the fence will allow for the safe removal of invasive species that threaten other trees, plants, and flowers in the area, and will be replaced with native species – the way the original planners of Dumbarton Oaks Park intended. 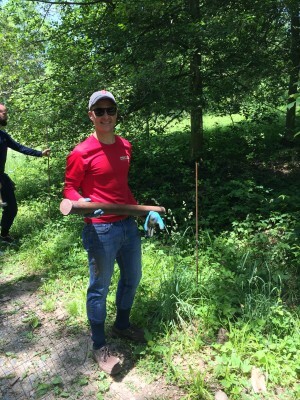 Many thanks to our volunteer coordinator, Pat, for organizing this great event, and to John, Bonnie, Kirk, and Lauren for giving their time to improve one of our favorite running trails! Background information on the project. 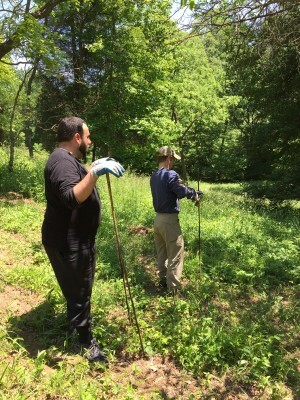 Kirk (right) hard at work installing the fence! 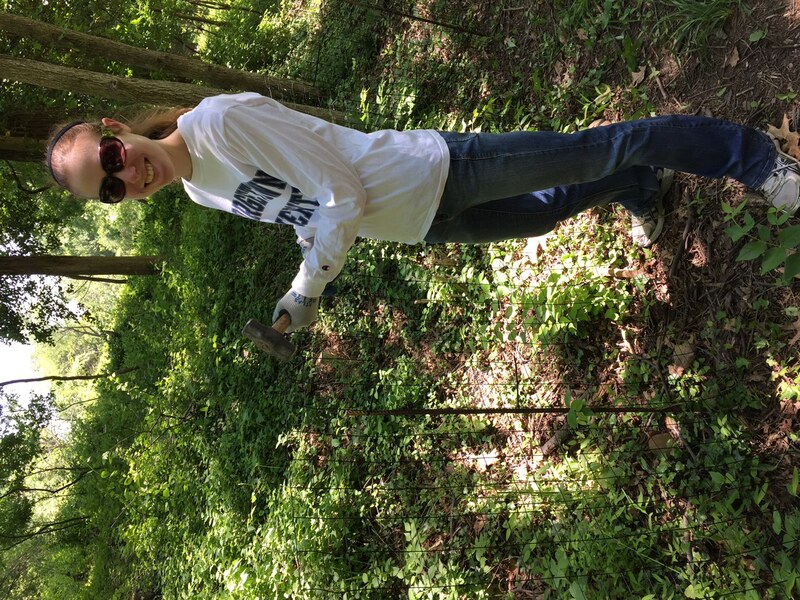 Lauren learning the ropes of fence installation. 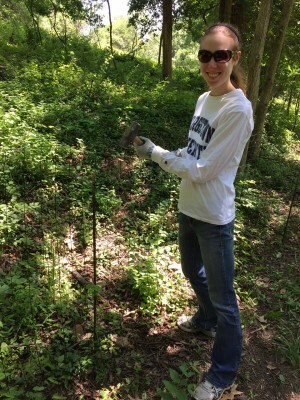 Pat, our fearless leader, showing the rebar who is boss! Bonnie is all smiles after a job well done. Thanks Pat, John, Kirk, Bonnie, and Lauren, for your help! Don’t forget! WRC Happy Hour is tomorrow! Hey runners! 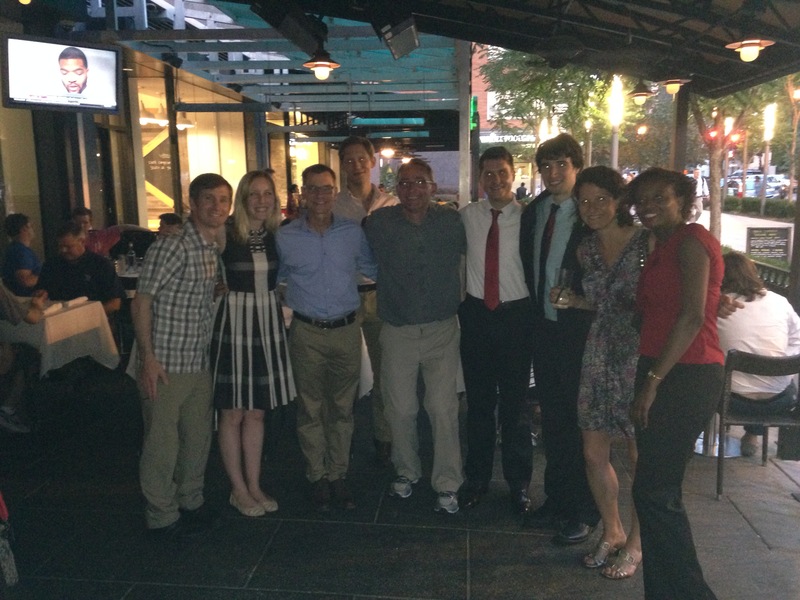 The Washington Running Club happy hour is tomorrow, Wednesday, May 27 at 6:30 p.m. at Circa in Foggy Bottom. All are welcome. We hope to see you there! 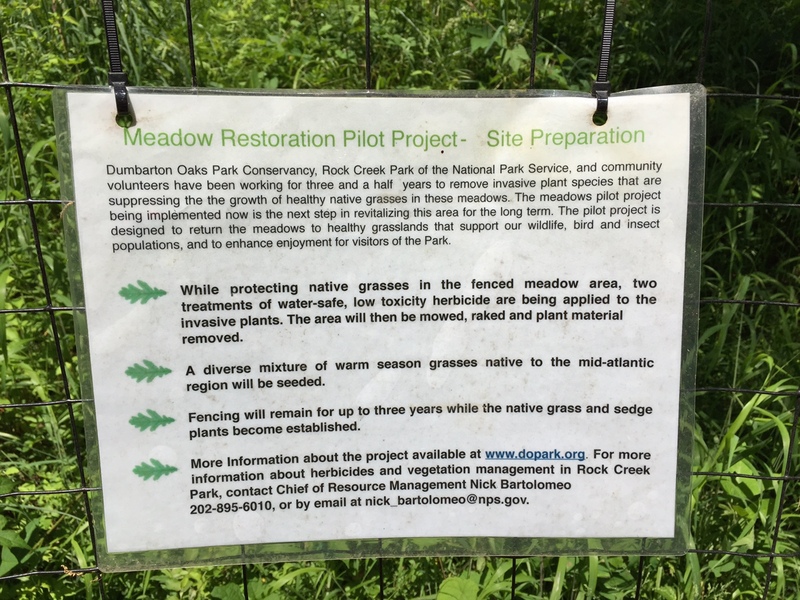 SDR for 5/24, New Start Time, and Giving Back! Memorial Day Weekend may be the unofficial start to summer, but for WRC, it’s an opportunity to give back to both the military and our city – and that’s what this holiday is all about. First off, we’ll burn off all (or most) of our hamburgers and hot dogs at our Sunday Distance Run. We’ll start at 7:00 a.m. (NOT 8:00 a.m.) just in front of the CB2 store on M Street in Georgetown. Distances will vary from 5-15 miles, with three pace groups of 7:00-7:30 min/mile; 8:00-8:30 min/mile, and 9:00-10:00 min/mile. 1: Post SDR coffee/carbs at Dog Tag Bakery: this bakery is located on Grace Street NW, just a bit south of the M St NW/Wisconsin Ave NW intersection. The bakery is a non-profit that supports veteran’s with a work/study program that prepares them for the work force. Our former president, Kirk, took one for the team and taste tested their baked goods – and he approved! It’s a great combination of eating well and giving back to an important cause. 2. 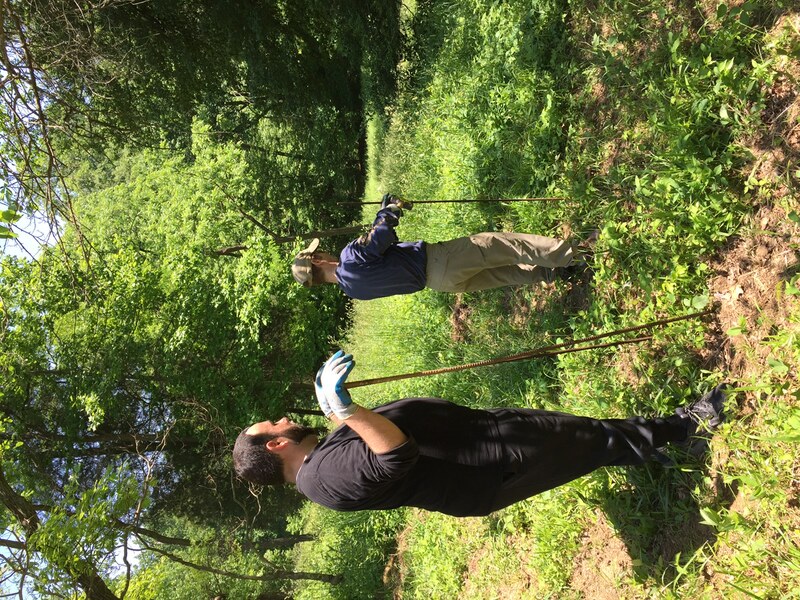 Cleaning up Dumbarton Oaks: our volunteer coordinator, Pat O’Keefe, will be at Dumbarton Oaks for a trail clean-up. 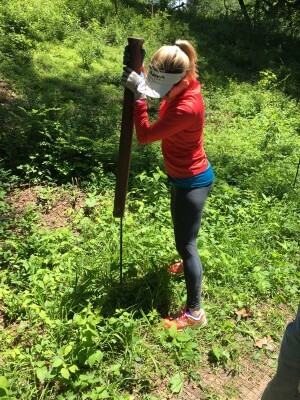 When: Sunday, May 24, 10:00 a.m. – 2:00 p.m.
What: trail clean up and repair – – – THIS IS STRENUOUS WORK. Please come ready to lift objects and be on your feet for a long time. Dress appropriately – closed toe shoes only. Gloves, tools, training, water, and snacks will be provided. Join the Washington Running Club on Sunday, May 17 for our weekly distance run. We’re meeting at 8:00 a.m. in front of the CB2 store in Georgetown, followed by coffee, carbs, and conversation at Dean & Deluca. We’ll have three groups, including a 7-7:30 min/mi group, an 8-8:30 min/mi group, and a 9-10 min/mi group. Our regular loops can easily be made shorter or longer depending on the distance you need to run. IMPORTANT: this is the last week of 8:00 a.m. start times. Starting Memorial Day weekend (5/24) through Labor Day weekend, we’ll be starting at 7:00 a.m. to beat the heat (as much as we can, anyway). Enjoy your sleep! It’s time to get happy – happy hour, that is! 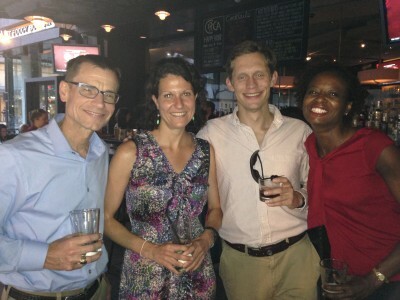 That’s right, the next WRC happy hour will be on Wednesday, May 27 at 6:30 p.m. at Circa in Foggy Bottom. We’ll celebrate another great season of racing and being a part of an awesome running group in general.